No one could ever accuse Jon Huntsman Sr. of aiming low. Born poor, he sought not to create a business but an international empire. Diagnosed with prostate cancer, he set his sights not only on surviving, but also on creating a research institute to eradicate all cancers. From his gleaming office in the foothills of the Wasatch Mountains, he saw himself not as Utah’s wealthiest resident (which he was for many years) but as the state’s caretaker, seeking to help the homeless, bolster the state’s colleges and ease tensions between Mormons and non-Mormons. Huntsman, a billionaire chemical industrialist and one of the world’s most generous philanthropists, died Friday at age 80. In his final years, as his health failed him, Huntsman sought to reinforce the cancer institute that hugs the hills on the University of Utah campus and hand control of his charitable and business endeavors to his children. He expected the next generation of Huntsmans and the one after that to continue to expand the family’s vast reach. Peter runs Huntsman Corp. and oversees the Huntsman Cancer Foundation. His older brother, Jon Huntsman Jr., is a former governor and Republican presidential candidate, now serving as the ambassador to Russia. Paul Huntsman is the owner of The Salt Lake Tribune, a purchase guided by his father. Other children serve roles in The Church of Jesus Christ of Latter-day Saints, oversee the Huntsman World Senior Games and the Huntsman Education Awards, among other endeavors. The Huntsman name is well known and well respected in Utah and far beyond because of all Jon Huntsman packed into his rich life. And that life started modestly. (photo courtesy Huntsman family) Jon Huntsman with his family in 1948. He was born June 21, 1937, in Blackfoot, Idaho. His father, Blaine Huntsman, a schoolteacher, was abusive. He described his mother, Kathleen Robison Huntsman, as nurturing and sweet. For a time, the family lived in a two-room house without plumbing. Jon Huntsman believed his father’s rage stemmed from his inability to provide for his family. That left an enduring mark on him and his two younger brothers. A diligent student, Huntsman earned a scholarship to attend the University of Pennsylvania’s renowned Wharton School of business. He then joined the Navy, serving as a gunnery officer aboard the USS Calvert. Through it all, he remained close to his high school sweetheart, Karen Haight, who would become his wife and trusted confidante. He proposed during the Christmas break of his senior year, using money he won during a poker game to buy her a diamond. They married in June 1959, just weeks after he graduated. (photo courtesy Huntsman family) Jon and Karen Huntsman were married in June 1959. It was through Karen’s connected family that Huntsman got his first job in a California plant, where he tried to master a new product — polystyrene. “I was in over my head,” Huntsman said, looking back to the start of his career in the chemical industry. In 1970, Huntsman and brother Blaine Jr. launched their own polystyrene company. Huntsman Container took off after it won a contract to create the clamshell for McDonald’s Big Mac. Even with his business in its infancy, Huntsman accepted a job as the staff secretary to President Richard Nixon, which he landed with the help of a Wharton alumnus. Huntsman managed the steady stream of papers that went in and out of the Oval Office and oversaw staff salaries and benefits. He left that position shortly before the Watergate scandal and was not implicated in any of the crimes that led to Nixon’s resignation. He maintained a soft spot for the president, whom he gave a leather-bound Book of Mormon, his faith’s signature scripture, when he left his White House post. (photo courtesy Huntsman family) The Huntsman family visits with President Richard Nixon in the Oval Office in 1971. While in Washington, Huntsman got to know the Marriott family, owners of the ubiquitous hotel chain, who often hosted gatherings for fellow Mormons living or working in the D.C. area. Bill Marriott, a close friend, remembered Huntsman as a compassionate, bright businessman and a fighter. A gambler at heart, Huntsman moved his family to Utah and started borrowing millions of dollars to buy polystyrene plants in the 1980s, when prices were rock bottom because of a glut in the market. He was betting the polystyrene surplus eventually would turn into a shortage as more and more products were made from plastics. If he was wrong, he’d be ruined. By 1990, he was worth $450 million; six years later, that would climb to $2.5 billion. His business would continue to ride the ups and down of a volatile chemicals market, staving off bankruptcy on more than one occasion. Reaud said Huntsman kept his word. The two became close and while Reaud remains a high-profile trial attorney, he also joined Huntsman Corp.’s board of directors. Reaud based that praise in part of Huntsman’s generosity. Huntsman said he had always donated to charities, but the first gift that drew major attention came in 1987, when he gave $5 million to the University of Utah. He didn’t put any restrictions on how administrators could use that money, a rarity with a gift of that size. In recognition, they named the U.’s basketball arena after him. (Tribune file photo) Jon Huntsman and Norm Bangerter are seen in this undated photo. The following year, he contemplated a run for public office. He challenged incumbent Gov. Norm Bangerter for the Republican nomination in 1988. A month later, Huntsman stepped aside, refocusing on growing his business. Not long after that, a health scare would give him a new life mission. In 1969, Huntsman held his mother as she died of breast cancer. In 1990, he watched as his father succumbed to prostate cancer, and, a year later, doctors told him he had the same deadly disease. Before he went into surgery in 1992, Huntsman and his family visited Salt Lake City’s homeless shelter and gave the director a handwritten note along with a $1 million check. Then they gave another $1 million to the food bank run by the Roman Catholic Church. (photo courtesy Huntsman family) Jon Huntsman meets Pope John Paul II in 1993. Huntsman also donated $500,000 to an early cancer detection program at Intermountain Healthcare that likely saved his life. Jon Huntsman Jr. said the contributions had a “cathartic effect” on the nervous family. Huntsman’s 11-day stay in the University of Utah Hospital was traumatic and life-changing. The room was drab and the nights stretched on and on. He thought he could change the experience for future patients, and he thought more should be done to fight cancer. He started small, giving $1.25 million to the U.’s School of Medicine, and then he went large. Very large. He committed to creating a cancer institute. It would be part hospital, where the rooms would be inviting and the food restaurant-quality, and part research center, where well-funded scientists would seek cures tapping the best technology around. The cancer foundation he created has handled fundraising and marketing for the growing institute ever since. In June 2017, it opened a new research wing focused on cancers affecting children. Through the years, Huntsman has donated or committed to donate at least $580 million to the Huntsman Cancer Institute and has set up other investments to funnel money its way for decades to come. (Al Hartmann | The Salt Lake Tribune) Karen and Jon Huntsman speak at the dedication of the Huntsman Cancer Institute Hospital expansion on October 28, 2011. He signed the “giving pledge,” launched by Warren Buffett and Bill and Melinda Gates in 2010 and targeted toward the world’s billionaires. Signatories promise to donate at least half their wealth. Huntsman saw this as a rather paltry amount, arguing the bar should have been set at 80 percent of their riches. He also criticized the many ultrawealthy who wouldn’t sign. Throughout his lifetime, Huntsman donated at least $1.8 billion to charity, making him one of roughly two-dozen people on the planet to give away more than $1 billion. That total, though, does not count the money he tithed to the LDS Church. He has proudly lent his private jet to Mormon prophets and apostles, and has served as a bishop, stake president, mission president and an area Seventy. He was a frequent fishing buddy, for instance, of the faith’s 16th president, Thomas S. Monson. One time, he even grabbed Monson’s belt to keep him from falling into an Idaho lake while the LDS leader reeled in a prized trout. (photo courtesy Huntsman family) President Thomas S. Monson is steadied by Jon Huntsman, Sr., as he tries to a land a trout. Ronald A. Rasband, a member of the faith’s Quorum of the Twelve Apostles, met Huntsman at church when Rasband was still a college student. Huntsman tried to hire Rasband and the student said he needed another year to graduate. Huntsman said he wanted him on the corporate jet to tour a plant in Ohio that very week. Rasband ended up dropping out of college. He worked his way up the ranks at Huntsman Corp., where he eventually became the president. Huntsman loved his faith, but he also embraced those who were less religiously oriented, including some of his relatives and even some of his children. Concerned about the rift between Mormons, who make up about 60 percent of Utah’s population, and the rest of the state’s residents, Huntsman, along with former Salt Lake City Mayor Rocky Anderson, created the Alliance for Unity in 2001. The alliance included faith leaders, business executives and newspaper editors, seeking to build comity in the public square with varying degrees of success. The group played a pivotal role in the compromise that ended the divisive fight that erupted when the LDS Church bought of a block of downtown’s Main Street for a private plaza. Huntsman helped negotiate the sale of a piece of church property for a “unity center,” in a less wealthy part of west Salt Lake City, offering educational programs, health clinics and small-business support. It was just one way Huntsman sought to steer Utah’s future. He also supported the Utah Symphony, even though he wasn’t a fan of the music, because he thought a great state should have a great orchestra. He contributed more than $56 million to the business school at Utah State University, and has directed the creation of a Huntsman Scholar program to offer additional guidance to promising students. And, in 2016, he helped his son, Paul, negotiate the purchase of The Tribune, because he believed the state needed a major newspaper not owned by the LDS Church. Meeting with Tribune staffers, Paul Huntsman named his father chairman emeritus of The Tribune. Jon Huntsman has also championed his eldest son’s political career. He was a major force in Jon Huntsman Jr.’s gubernatorial campaign in 2004. Huntsman Jr. won and became a popular governor, who glided to re-election in 2008. (Chris Detrick | Tribune file photo) Jon Huntsman Jr and Sr walk around Deer Valley Resort in June 2007. Huntsman watched with pride as President Barack Obama nominated Huntsman Jr. to be U.S. ambassador to China during a White House ceremony in 2009. His son returned from Beijing to announce his 2012 presidential campaign on his father’s birthday. Due to that campaign, Huntsman Sr. was released from his position on the LDS Church’s Fifth Quorum of the Seventy. Huntsman Jr. dropped out of the race after the New Hampshire primary, though his father never stopped arguing that his son would make a great president or secretary of state. President Donald Trump nominated Huntsman Jr. to serve as the ambassador to Russia in 2017. A lifelong conservative, Huntsman no longer identified as a Republican. Instead, he said he was the founding member of the “cure cancer party.” What he meant was he would donate to politicians of either major party as long as they supported federally backed cancer research. He became close with former Senate Majority Leader Harry Reid, a Nevada Democrat and fellow Mormon. And he criticized Sen. Mike Lee, R-Utah, for his role in causing a temporary government shutdown in 2013, largely because of its impact on cancer research. Increasingly, Huntsman focused on the expansion of the cancer institute and its drive to use genetics to seek cures. Mary Beckerle, a nationally renowned researcher and CEO of the cancer institute, said the culture among the researchers and doctors has been molded by its founder. And while it is a publicly controlled institution, Huntsman felt, and his family continues to feel, responsible for safeguarding its reputation. That led to an awkward public spat in 2017, after University of Utah President David Pershing unexpectedly fired Beckerle, a decision that has never been publicly explained. Jon and Karen Huntsman, loyal to Beckerle, declared “war.” They sought the ouster of Pershing and Vivian Lee, the senior vice president for health sciences, the reinstatement of Beckerle and the drafting of a new agreement that would provide more financial support to the Huntsman Cancer Institute. 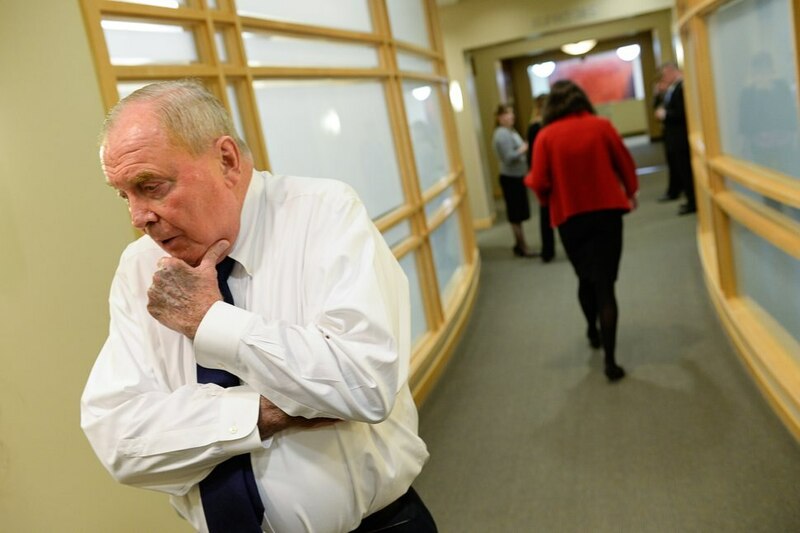 (Francisco Kjolseth | The Salt Lake Tribune) Mary Beckerle, acclaimed researcher at Huntsman Cancer Institute who was fired from her post as CEO and director of the Institute, walks away as Cancer Institute founder John Huntsman Sr. expresses his displeasure with the news on Tuesday, April 18, 2017. In the end, Beckerle got her job back, Pershing and Lee agreed to leave their posts, and the parties reached a new legal pact in which Beckerle would report directly to the U. president and the university would pay the institute $68 million to clear up a funding dispute. In recognition of the new long-term deal, Huntsman funded 12 new endowed chairs and reaffirmed his goal for the institute. Beckerle said the dispute showed multiple parts of Huntsman’s personality, including his fiery side. As CEO of the cancer foundation, Peter Huntsman, helped negotiate the truce and will guide that relationship going forward. That same year, he also took on a new responsibility at Huntsman Corp.
Huntsman Corporation President and CEO, Peter Huntsman, rings The Closing Bell¨ at the NYSE on Feb. 17, 2011. In December, Huntsman relinquished his title of executive chairman of the company he created, saying it was a “high honor” to hand over control to his son Peter, who became the board chairman on top of his role as CEO. The company has moved beyond the volatile market of polystyrene to focus on more stable designer chemicals. Headquartered in Texas, Huntsman Corp. now operates in about 30 countries and has roughly 10,000 employees. After a merger fell through, the company saw its stock rebound, hitting an all-time high, and it has paid down its debts. “It is probably in the best situation today than it has ever been in,” said Nolan Archibald, a former Black & Decker CEO, who is on the Huntsman Corp. board of directors. He said self-made businessmen have tried to hand over the reins to their children and it doesn’t tend to work. But Peter Huntsman has proved himself. Marriott believes Huntsman’s legacy will be threefold — his company, the cancer institute and his kids. (photo courtesy Huntsman family) The extended family of Jon and Karen Huntsman in 2013. Huntsman is survived by his wife and eight of his nine children, Jon Jr., Peter, Christena, David, Paul, James, Jennifer and Mark. Daughter Kathleen Ann Huntsman suffered from drug addiction and eating disorders throughout her life. Huntsman felt he had a special bond with Kathleen. At one point, after hearing that she needed serious medical help because of her eating disorders, Huntsman retreated to his bedroom. Two of his sons found him on the floor of the walk-in closet, clutching a portrait of his children as he wept. His youngest son, who goes by “Markie,” suffered brain damage at birth. He still lives in the Huntsman family home and is a mainstay at Huntsman functions, where Markie, 43, warmly greets friends and associates. Huntsman also has 56 grandchildren and 26 great-grandchildren. In an interview in 2014, he said he expects them to follow his lead, creating a dynasty of Huntsmans who feel a deep responsibility to give back to the community. “I would hope our children and grandchildren and great-grandchildren would feel equally comfortable in public office or philanthropy,” he said. As a painful condition called polymyalgia rheumatica began to sap his health and ruin his joints, Huntsman remained active in his business and philanthropic efforts. He created new funding accords with the cancer institute and the Utah State business school that bears his name. He spoke out in favor of medical marijuana. He knew his time was short, and he had thought of how he would be remembered. Beckerle recalls her first business trip with Huntsman. They went to New York City and stayed at a hotel where Huntsman appeared to be a frequent guest. He paused to say hello to the bellmen and the employee checking people into rooms. He knew their names and asked about their families. She’s watched many similar interactions in the past decade. The public is invited to attend Saturday, Feb. 10, 11 a.m., at the Huntsman Center, 1825 S. Campus Drive. On Friday, Feb. 9, there will be a public viewing at the Monument Park LDS Stake Center, 1320 S. Wasatch Drive, Salt Lake City. Columnist Paul Rolly and reporter Peggy Fletcher Stack contributed to this article. Correction: Feb. 2 • An earlier version of this story misidentified Bill Marriott, one of Jon Huntsman's close friends.